A predictable, dull film that’s merely a vehicle for Williams’s tediously overbearing comedy. There’s a great Family Guy cutaway gag in which Peter Griffin and Robin Williams are sitting on a sofa as Peter names topics such as religion and politics for Williams to comment on. Williams does so with his trademark brand of insufferable overbearing comedy, which is filling any amount of time with incessant, frenetic rambling. Peter responds simply with an exasperated sigh before leaving for a five minute break, which prompts Williams to start yet another barrage of supposedly funny noises. I felt much like Peter Griffin whilst watching Good Morning Vietnam. It reaffirmed my opinion that Williams was not the ‘tragicomic genius’ that so many purported him to be. Williams was much better as a straight actor. Read a short synopsis of Vietnam and you’ll know exactly what it’s all about: the loveable family favourite Robin Williams being kooky and charming the troops but clashing with straight-laced, humourless authority figures. It’s completely predictable and completely trite. They also throw in a love interest for good measure in the form of Trinh (Chintara Sukapatana), a wholly lifeless woman whom Williams refuses to stop pestering. Williams is never funny during his radio broadcasts, but the film repeatedly tells us otherwise, showing us scores of characters struggling to hold back their tears of laughter. So many of the supporting actors, whether they’re random troops or studio operators, were just diegetic canned laughter rather than proper characters. Make no mistake, Robin Williams isn’t playing Adrian Cronauer, he’s playing Robin Williams at his most loud and rambling. Williams is repeatedly characterised as the loveable clown who brings the people together, it’s rather nauseating. No matter how hard the film tries, it cannot convince me that he’s either funny or charming, it only succeeds in making him very irritating. Despite this, there are some moments that raised a smile, such as the language class scenes in which he focuses on New York City street talk rather than the artificial, staid sentences of the textbooks. Williams’s flatly developed adversaries Lt. Steven Hauk (Bruno Kirby) and Sgt. Major Dickinson (J.T. Walsh) are the typical officious military men. They develop a resentment towards him that’s so instantaneous that it’s contrived and unbelievable; they’re just narrative functions that try and make you feel sorry for Williams, the sweet crazy cookie. Both characters aggressively impose their superior ranks on Williams and the other men, reminding me of the great Machiavelli quote – ‘It is not titles that make men illustrious, but men who make titles illustrious.’ Quite frankly, the quote is wasted on a trivial, tiresomely annoying film like this. 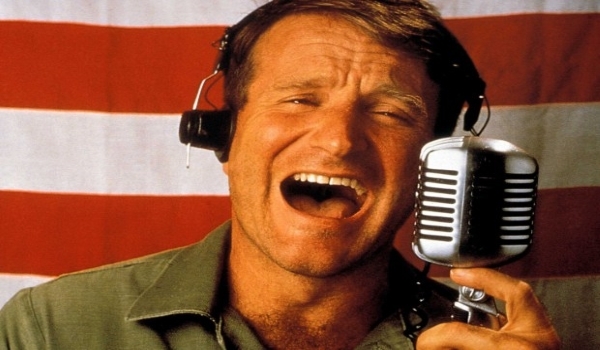 It sometimes attempts to be a drama or ‘dramedy’ with moments of perfunctory war moralising, but ultimately Good Morning Vietnam is preoccupied with indulging Robin Williams rather than achieving anything approaching credible commentary or pathos.